It wasn't long ago that some physicists said that optical invisibility cloaks would be impossible to build. This week, two teams are claiming to have built cloaks that work over a wide range of optical wavelengths and the extraordinary thing is that both designs are almost identical (see above). Invisibility cloaks work by steering light around an object fooling an observer who sees nothing back the background view. But while this works well for microwaves, it is not a straightforward matter to shrink these cloaks to a size that works at optical wavelengths. 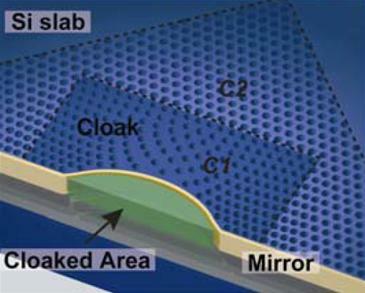 Now Michael Lipson and pals at Cornell University and Xiang Zhang and buddies at UC Berkeley say they have both built cloaks that are essentially mirrors with a tiny bump in which an object can hide. 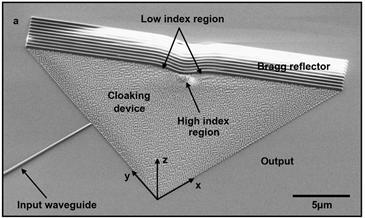 The cloaking occurs because the mirrors look entirely flat. The bump is hidden by a pattern of tiny silicon nanopillars on the mirror surface that steers reflected light in a way that makes any bump look flat. So anything can be hidden beneath the bump without an observer realising it is there, like hiding a small object under a thick carpet. You may wonder at the timing-- how can two teams come up with the same design at almost exactly the same time? The answer is that both designs are based on an idea dreamt up by John Pendry at Imperial College, London, and a colleague that we examined on the arXiv Blog last July. It's just taken both groups the same amount of time to build one. Faire qu'une bosse ait l'air plate et hop! on est invisible (grâce aux nanopilliers)... Facile en fait! The recently presented academic paper at the WWW 2009 Conference from a group of computer science academics from Cornell University investigates the collection of roughly 35 million geotagged photos collected from Flickr, uploaded by more than 300,000 users. Their approach used in Mapping the World's Photos [www2009.eprints.org, PDF] combines content analysis based on text tags and image data with structural analysis based on geospatial data. While individual users of Flickr are simply using the site to store and share photos, their collective activity reveals a striking amount of geographic and visual information about the world. For instance, their findings show that the Fifth Avenue Apple Store, which opened in May 2006, is more popular than many other well-known tourist sites such as St Paul's Cathedral in London, the Reichstag in Berlin and the Washington Monument in the US capital. 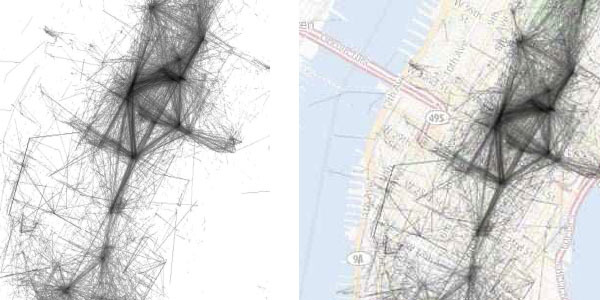 Interesting visualizations include diagrams for Manhattan and the San Francisco Bay area that illustrate the movement of photographers by plotting the geolocated coordinates of sequences of images taken by the same user, sorted by time, for which consecutive photos were no more than 30 minutes apart. "The figures are striking in the amount of detail they reveal about these cities. For example, one can clearly see the grid structure of the Manhattan streets, caused by users traveling and taking photos along them. The Brooklyn Bridge, in the lower center of the figure, is clearly visible, as are the Manhattan and Williamsburg bridges just to the north. One can even see the route of the ferries that take tourists from Lower Manhattan to the Statue of Liberty". Another figure shows maps of representative images for the top landmarks in each of the top 20 North American and European cities. It raises the intriguing possibility of an online travel guidebook that could automatically identify the best sites to visit on one's next vacation, as judged by the collective wisdom of the world's photographers. See also World's Eyes. Via Sydney Morning Herald. Intéressant évidemment de constater que l'on tire de plus en plus d'informations à partir de site regroupant des données (ici Flickr, des photos "taguées"). Les traces qu'on laisse ici et là sont analysables, etc. On connait désormais la litanie. Toutefois, quand par exemple ici les auteurs croient un peu aveuglément dans leur analyses (par exemple que l'Apple Store de la cinquième avenue est plus populaire que le Reichstag ou la cathédrale St Paul), je me dis qu'ils devraient pondérer leurs résultats par d'autres facteurs, socio-ethonologique. Par exemple que les personnes qui vont visiter un Apple Store (ce qui en soit est assez inquiétant) sont peut-être plus nerdy, équipés en enclin à prendre celui-ci en photo et le poster sur Flickr que des personnes qui visitent la cathédrale St-Paul. Various versions of the Turing test have been put forward over the years but only one is so tough that even humans haven't yet passed it. That will change if Florentin Neumann at the University of Paderborn in Germany and a couple of pals have their way. An entity passes the Hofstadter-Turing Test if it first creates a virtual reality, then creates a computer program within that reality which must finally recognise itself as an entity within this virtual environment by passing the Hofstadter-Turing Test. Spot the tricky circularity to this test? Players can only pass if they create a virtual intelligence which must then pass the test itself. And since that hasn't been achieved by any human in history, nobody has yet passed. What's interesting about the paper though, is that Neumann and co claim that humanity is moving closer to achieving a pass. First of all, we're half way there because we've already built various virtual worlds. And now Neumann and co claim to have implemented a version of the Hofstadter-Turing Test in the Second Life virtual world. "We have succeeded in implementing within Second Life the following virtual scenario: a keyboard, a projector, and a display screen. An avatar may use the keyboard to start and play a variant of game classic Pac-Man, i.e. control its movements via arrow keys." 1st: The human user installs Second Life on his computer and sets up an avatar. 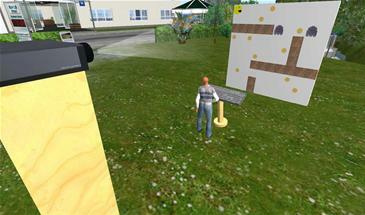 2nd: The avatar implements the game of Pac-Man within Second Life. 3rd: Ghosts run through the mace on the virtual screen. form of intelligence represented by a simple strategy to pursue Pacman." They're absolutely right that taking this on board requires a remarkable amount of generosity: the Ghosts in a Pacman game are unlikely to ever put in a decent challenge in any other type of Turing Test. But suppose we give them the generosity they desire. The process raises some interesting ways of analysing the various levels of reality that could occur when machines become intelligent. And what of the possibility that our efforts may be validating the intelligence of a programmer exactly one level higher than us? Où l'on reparle du Test de Turing et 2nd Life... Raisonnement un peu étriqué, mais qui n'est pas sans rappeler par certains aspects le côté absurde d'Electroscape 004 (AI vs AI in self space). In another targeted shot at Twitter, Facebook is expected to announce on Monday that developers can take the streams of Facebook status updates on user profiles and mix them into new applications. Just like the massive Twitter ecosystem, this could lead to a blossoming of innovation around Facebook streams. To take advantage of the new services, users would have to allow the companies to receive access to their Facebook data, according to people familiar with the matter, and users’ privacy settings on Facebook will extend to any new services built. And this, I think, is the reason Facebook’s open ecosystem, despite its 200 million-plus users, may not kill off Twitter’s traction with developers: Facebook’s culture is one of privacy and shared updates with friends. Twitter is all about public updates, and hence users love for you to mash up their Tweets into public-facing applications like TweetingTooHard. We’ll likely see a bunch of new applications to post media to Facebook (think: browser plugins and desktop applications) and explore content from friends, but building an open ecosystem will not change the closed culture of Facebook and our willingness to share with only a small circle of personal friends there. Twitter, then, remains the most open…culturally, at least. With a new probe, smart phones can be used to capture and send ultrasound images. 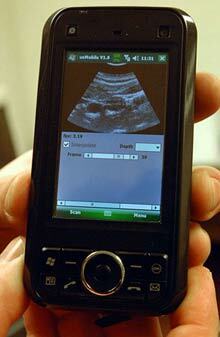 Mobile medicine: The ultrasound image shown here was captured using only a portable probe and the smart phone itself. In a twist of engineering that could redefine mobile medicine, researchers have built an ultrasound device that can be plugged directly into a smart phone's USB port. The system can capture ultrasound images of pregnant bellies and blocked carotid arteries, display them immediately on-screen, and even use the phone's capabilities to send that data just about anywhere in the world. Physicians rely on ultrasound imaging for everything from monitoring fetal and cardiac health to providing guidance when placing catheters and central lines. Most of the time, however, the systems are large and cumbersome--handheld probes attached to wheeled computers the size of filing cabinets. They're also quite pricey: the larger, more versatile systems can cost $25,000 or more. Self-contained pocket-sized systems do exist but cost about $10,000. Nothing available today provides a low-cost, mobile solution that can be used remotely to both gather and transmit images. The compact ultrasound probe, developed by computer engineers at Washington University, in St. Louis, has the potential to do all of that and more. Prompted by a grant program at Microsoft that called for the design of smart-phone-enabled medical devices, William Richard and David Zar started with an instrument that they developed five years ago: a $2,000 ultrasound probe that can plug into a laptop's USB port. Richard transferred all of the computing power into the probe itself and decreased its power draw to just half a watt; Zar created the necessary software and drivers. To squeeze such capabilities into the probe, Richard and Zar had to make some concessions. In order to decrease its power requirements, Richard had to also decrease the amount of data that the instrument transmitted. The images themselves are smaller and less detailed than those from a full-size ultrasound. But while it has yet to undergo rigorous testing and comparisons, the researchers believe that its capabilities should be more than sufficient for many medical applications. They point to a number of potential uses: remote medicine for rural communities and developing nations, emergency imaging of patients en route to the hospital, battlefield medicine, and even home use in patients with chronic diseases. "Looking back on this 10 years from now," Richard says, "these are going to be used in places we never would have imagined." The most obvious and immediate use is providing care for people in underserved communities, both in the United States and abroad. Even in some of the poorest nations, cell-phone networks are fairly ubiquitous and could be used to immediately send images taken by the probe to a trained medic for interpretation. Gari Clifford, a computational physiologist at the Harvard-MIT Division of Health Sciences and Technology, is interested in incorporating the new ultrasound probe into a remote medicine system that he's developing. By prescreening pregnant women in remote areas for dangerous complications, "we can advise them to go into a more urban and centralized clinic to give birth," he says. "Many rural clinics in developing countries really don't have the expertise or technology to do this kind of screening." Shadab Mahmud, a program manager at Grameen Healthcare, offers a similar vision. The nonprofit, which is part of the same group of enterprises as the Nobel-winning Grameen Bank, was recently launched to provide sustainable health care in Bangladesh. "In developing countries, about 95 percent of the births occur at home, and that's where most of the deaths occur as well," Mahmud says. "The ultrasound probe is an integral part of a kit that each and every community health worker would have." A number of groups have already expressed interest in the device. According to Zar, for the same $2,000 that buys the laptop-based probe he helped develop, the manufacturer can build the smart-phone version, and he aims to have open-source software available this summer. (The user must also have a compatible phone; currently, only a few have the necessary capabilities, such as a USB port that can read input and provide power.) Richard is already looking further ahead: his goal now is to create a $199 version that could one day be sold in drugstores for home use.